An artist's depiction of NASA's DART mission to nudge an asteroid off course. Specifically, planetary defense is about largish asteroids that could theoretically collide with Earth, and what humans could do to protect ourselves. Slam into an asteroid hard enough while it's sufficiently far away from Earth, and you can bump it off course. But if you've never slammed into an asteroid before, it's difficult to know precisely the best way to do it. And that's where DART comes in. Its target isn't a threat to Earth, but by studying it carefully and then colliding with it, Chabot and the rest of the DART team will create the data humans will need if they ever want to redirect a truly threatening asteroid. 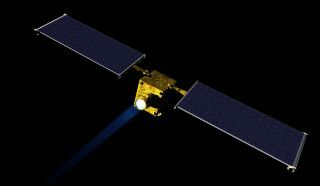 It's a very different type of mission from the other asteroid visits that have drawn headlines this year, such as those of NASA's OSIRIS-REx and Japan's Hayabusa2, which each made strides toward tapping near-Earth asteroids to collect samples to bring home. Scientists hope those samples will help them understand the solar system's earliest days. This NASA graphic shows how the Double Asteroid Rendezvous Test (DART) will crash into a moonlet of the asteroid Didymos in 2022. DART's target Didymos was chosen based on very different criteria. It's a binary asteroid, which means DART can slam into the smaller object of the pair. But scientists can gather robust data about the bodies and their locations from Earth, which will help them track where to target the car-size spacecraft as well as how much the collision knocked the object off course. "It's interesting, because it's a space mission, but the telescopes are such a huge, important part of the mission succeeding," Chabot said. "We have to know where this moon is in order to impact it, to make this maximum deflection. We kind of take for granted that we know where everything is at all times. We understand where the system is as a whole, but specifically where that moon's gonna be [requires tracking] because we want to try to hit it head-on." These 14 radar images show the near-Earth asteroid Didymos (65803) and its moonlet as seen by the Arecibo Observatory radio telescope in Puerto Rico in November 2003. Then, there's the impact itself, with the spacecraft slamming itself into the space rock at a speed of nearly 13,500 mph (6 kilometers per second). If the mission launches as currently planned in June 2021, that collision will come in October 2022. The first is a cubesat, called Light Italian Cubesat for Imaging of Asteroids, which the Italian space agency has proposed to send with DART. The second is a European Space Agency mission called Hera, which it is considering launching in time for it to arrive at Didymos in 2026. That spacecraft would be able to study the binary asteroid in more detail and measure the crater DART creates. A simulation of what asteroid Didymos and its moonlet Didymoon may look like. Chabot said that so far, people seem excited and on board with the idea of hurling a spacecraft into an asteroid, just in case we ever need to do it for real. But she also said that we can learn only so much from the experiment, and that if an asteroid really does loom, we'll need a heads-up — so continuing to observe and identify asteroids is crucial. "To do something like this, we'd also need a really long warning time; the idea of a kinetic impactor is definitely not like [the movie] 'Armageddon,' where you go up at the last hour and you know, save the Earth," Chabot said. "This is something that you would do five, 10, 15, 20 years in advance — gently nudge the asteroid so it just sails merrily on its way and doesn't impact the Earth."